Windsor Lodge sits on the elevated slopes of Queenstown Hill, situated in a quiet leafy street this large home is perfect accommodation for multiple families or large groups. Spacious living with 5 bedrooms, 3 large bathrooms 2 of which have a large bath, an enormous kitchen, large double garage and plenty of off street parking for extra vehicles. Windsor Lodge can boast it has the living space to match the large number of guests it accommodates. Windsor Lodge is a 15 minute minute walk to town and enjoys lake and mountain views including Bobs Peak and the Remarkables. All new comfortable beds in all 5 bedrooms. 4 double bedrooms on the main floor and the 5th bedroom in the loft is large 40 sq meters sleeping 6 easily. The loft is also set up with a large television and serves as an extra living space. The Super King beds in all the bedrooms can be split into singles giving plenty of options for sleeping larger groups. A new outdoor spa pool overlooking Lake Wakatipu ticks that final box for the ultimate holiday. My husband Gordon and I have owned and operated Lodges in Queenstown for 11 years. We are familar with all things Queenstown and we enjoy sharing not only our homes but also our knowledge of this beautiful part of the world. We are here to help. Queenstown is absolutely beautiful and with out a doubt the jewel in the crown of New Zealand. No trip to New Zealand is complete without a visit here. We often have guests who come for just 3 days and we always hear that they wished they could stay longer. An ideal time to stay is a week, the surrounding areas are just as stunning as Queenstown itself and worthy of extra time. We can recommend several excellent day trips to places like Glenorchy, Wanaka and Bannockburn. 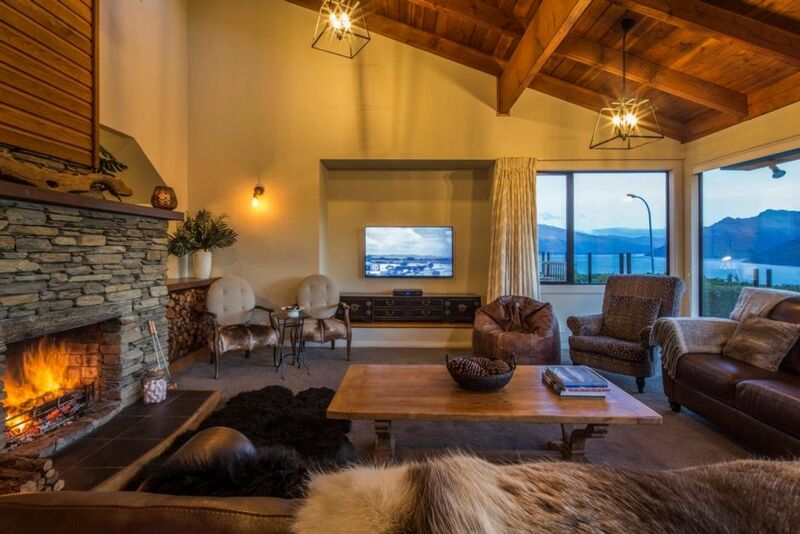 Windsor Lodge is fabulous, a real lodge ambiance combined with space and luxury furnishings makes this the perfect accommodation for your trip to Queenstown. Heat Pumps/ Airconditioners on both levels ensure you are warm in Winter and Cool in Summer. An excellent Indoor/Outdoor flow to a back courtyard and to a front deck, both provide even more space for you all to spread out in the warmer months. Airconditioning untis on 2 levels. Heat pumps on 2 levels and heaters in all the bedrooms. The best white linen on offer in Queenstown. Open wood fire in the lounge and a logburner in the dining room . space to park and extra 3 cars off street. No fees. Space for 1 large car. Ultra fast Wifi, the best on offer in New Zealand. Lodge living at its best, a real ambiance with a roraing open wood fire, the real thing. Food is not intentionally supplied but you are welcome to use what is there. Except tea, coffee, spices and condiments. A full very well equipped kitchen with everything to cater for a large group. Windsor Lodge was everything we could have asked for & more. Windsor Lodge was everything we could have asked for & more. This quality, well appointed property has all finishing touches for a perfect venue for our special birthday celebration with friends. Although it didn't bother us, some may be deterred by the steep walk up the hill from the town, but taxis are plentiful and inexpensive. The views over the mountains were fabulous especially from the hot tub. Set in a quiet neighbourhood, this property suits a mature group perfectly. Fabulous! Beautiful place to stay, well equipped and furnished for large groups. Beautiful place to stay, well equipped and furnished for large groups. Spa pool a lovely bonus! lovely place with pretty much everything u need.